A cron job is a process to run a page automatically on server. After setting up a cron job we do not need to run it on daily basis. 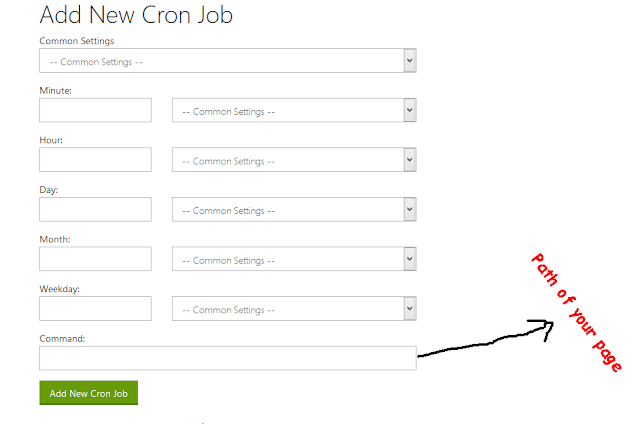 We can execute a page automatically at any time on daily basis by setting a up a cron job. Here I am going to explain the step wise step process of setting up a corn job in cpanel of godaddy server. So If you want to execute a page on daily basis at a particular time, follow below process of setting up cron job. Cpanel -> Section Advances -> Cron jobs menu. Add Cron e-mail if you want to notify by email when your cron job run. if you want to use relative path then different commands are divided by ";"
There is no need to use full path to environment, environment interpreter directive will be enough on shared servers. How To Generate And Download A Dynamic Excel Sheet Using PHP ?